11km south east of Carpentras via the D4. 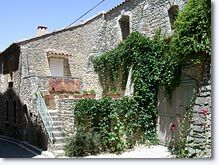 Perched at the summit of a rocky outcrop, Venasque is a picturesque village classed amongst one of the 126 "most beautiful villages in France". 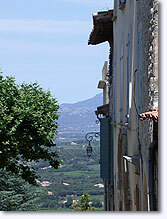 Venasque dominates the Nesque valley and the Carpentras plain. Due to its strategic situation, the village has an interesting and dramatic past. Protected since ancient times, Venasque has preserved its history: The "Monuments Historiques" have classified the very beautiful baptistry. Its origins are unclear, but it is believed to be the oldest religious baptistry in the region. 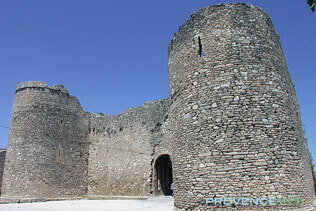 The 12th century church and its three Saracen towers are also classified, (the highest measures 18m). From the the towers, there is a brilliant view of the north of the Comtat, the Dentelles of Montmirail and Mont Ventoux (1,912 m). 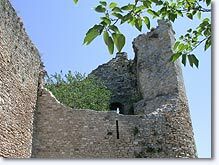 Around the village, you will see the ruins of the ramparts which once surrounded the town. Several beautiful chapels can also be seen on the outskirts of Venasque and they make a good pretext for a scenic country walk. 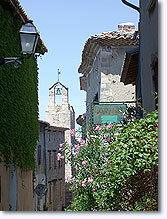 Venasque is one of the oldest villages of the Comtat Venaissin, from where it takes its name. This respect for the past has almost given Venasque a slightly austere feel, due to its authenticity. Its houses are rebuilt to original specifications. The Saracen towers. St Siffrein chapel. 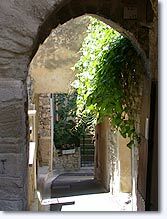 Priory of St Pierre les Thermes. Hiking, horse-riding, tennis and climbing. 2 Charming and separated cottages for 4 pers. 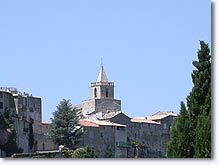 Malemort du Comtat (4km), Saint Didier (5km), Méthamis (6km).